I don’t know about you but I am still in a surreal state. Waking up every morning and giving God much thanks for allowing me to experience this victory. In the early days of November leading up to the election I was so anxious. The last time I was this anxious about anything was the day Nelson Mandela stepped out of prison. He was so sick that the South African government did not want him to die in prison. I thought they would kill him on the outside and for months I was anxious for his safety. I have felt the same way leading up the primary and the actual election. I thought the Republicans were going to steal the votes from Barack. On November 4th it was difficult to focus on any work as the nation, the world waited for this historical event. November 3rd was a bittersweet day for many when Barack’s grandmother Mrs. Madelyn Dunham died. Everyone was sad but I saw it as a profound spiritual move on her part. She had done all she needed to do for her grandson on earth. Loved him unconditionally and prepared him for the task ahead. Look what kind of man she had raised. She decided to make her way to heaven to make sure God received all the prayers that were being sent to Him. One final personal request. She must be smiling down on her precious grandson Barack, along with Dr Martin Luther King, Rosa Parks, Malcolm X, Medgar Evers, Marcus Garvey, Nanny, Sam Sharpe and so many warriors who have paved this path of Justice and freedom for us all. Now Washington D.C. will be the mecca for every person young, old, black, white as we prepare for his inauguration on January 20th. History in the making. I will say it now with confidence although President Elect Barack Obama won’t be able to adjust and achieve everything in his presidency. I assure you he will serve two terms and will be one of the most popular and dynamic presidents the White House has ever had. He has already changed the face of America. OK so you have heard, read and seen everything about President Elect Barack Obama. Here is just another perspective – what does his handwriting tell you? What makes Barack Obama tick? 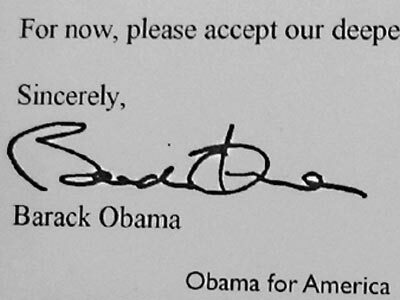 Here is a brief analysis of his handwriting: Barack Obama is a complete optimist his upward strokes express this. The large capital letter B demonstrates a man that is confident and self assured. The open bottom of the letter B expresses his open ability for clear communication. His letter O is the same size as his first name which tells us about his family pride both past and present. The vertical stroke of his signature tells me he is a logical and practical person. Don’t be concerned about the illegibility of the signature. Illegible letters in any name demonstrates the swiftness of his mind. Author of Reaper of Souls-A Novel Based on the 1957 Kendal Crash.